Last summer I went to the Glasgow screening of the above film about The Wrecking Crew, the crack bunch of LA sessioneers who played anonymously on a whole host of things, from film and TV scores via advertising jingles to some of the biggest-selling and best-loved songs of that golden period in early-mid 60s pop music. Tommy Tedesco was a jazz guitarist, and somehow found himself part of that inner-circle of session men and women. Made by Tommy’s son Denny, the film is a celebration of the life and work of his father and The Wrecking Crew. It’s terrific. Denny has, for the past couple of years, been touring the world showing his movie at Film Festivals and special screenings in a bid to drum up the finance required to support the publishing rights of the film. It’s impossible to make a movie about such great music without actually featuring that same music, and seemingly it costs a whole lot of money to negotiate the publishing minefield that the lawyers and money men have put in front of him. If you ever win the lottery and want to help someone out, I’m sure Denny would be more than happy to take your call. If you ever get a chance to see his film, grab it with both hands. Much of the music featured throughout the years on Plain Or Pan is a product of The Wrecking Crew, so if you’re a regular on here, I’d even go so far as to say it’s right up your street. 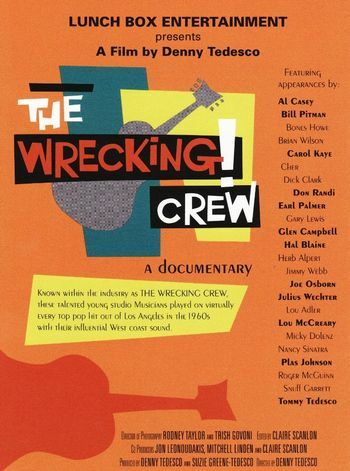 The Wrecking Crew were the go-to guys in the LA recording industry. Slicker than the Brycleem covering Bing Crosby’s bald bits and packing more swing than Sinatra with a six iron, they swept aside the old shirt ‘n tied brigade with little regard for history or unwritten rules. Working quickly and cheaply, and with the ability to read charts and scores of music at the drop of a cocked hat (they had backgrounds in jazz and classical) they were able to turn their hand to anything at all. Often, they came up with the licks and riffs that we all still whistle and hum today. Uncredited. The intro to Wichita Lineman? The intro to These Boots Were Made For Walkin‘? Plucked from thin air by The Wrecking Crew. Working on flat union fees rather than the gamble of percentage royalties, each musician knew that if they played more than one session a day, by the end of the week after they’d multiplied up the standard session fee, they’d be rich. They were so much in demand that playing only one session a day was not ever likely. 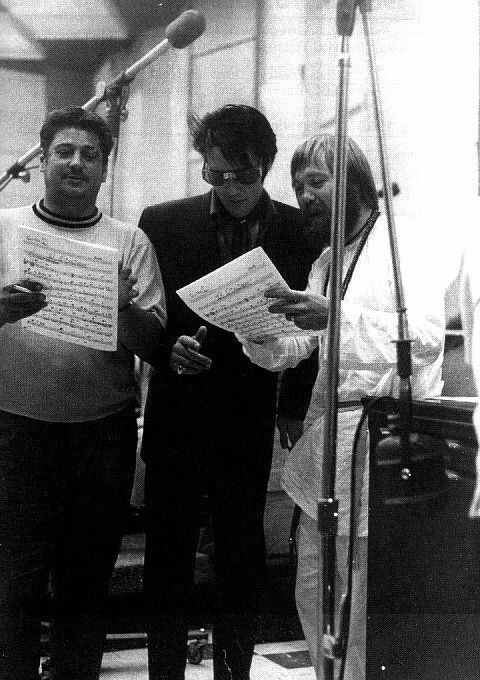 Producers would request The Wrecking Crew, then hold off the recording session until the Crew could fit them in. The Wrecking Crew did them all. In and out the studio in the time it took to learn the part and record it before going off to the next one. And the next. And the next. Without the benefit of hindsight of course, they had no idea that this music they were playing would shape the sound of popular music forever. The roll call of records and groups bearing The Wrecking Crew’s stamp is a super-long embarrassment of riches. Off the top of my head – all of Phil Spector‘s epoch-defining Wall Of Sound records, many Beach Boys records, including the sessions that would produce Pet Sounds and Smile, the Elvis ’68 Comeback Special for TV, The Byrds first album (only Roger McGuinn was considered good enough to play on it. The other Byrds sang, but the rest of the music was provided by The Wrecking Crew), a ton of Dean Martin stuff, Frank Sinatra‘s Summer Wind, the Pink Panther theme, Aquarius by the 5th Dimension, most of The Monkees records (Mike Nesmith was The Monkees’ version of Roger McGuinn), Somebody Groovy, California Dreamin’, Monday Monday and countless other Mamas And Papas tracks, Harry Nilsson‘s Everybody’s Talkin‘, Sonny & Cher‘s And the Beat Goes On. And on. And on. And on. You get the idea? The Wrecking Crew were seemingly involved in everything. 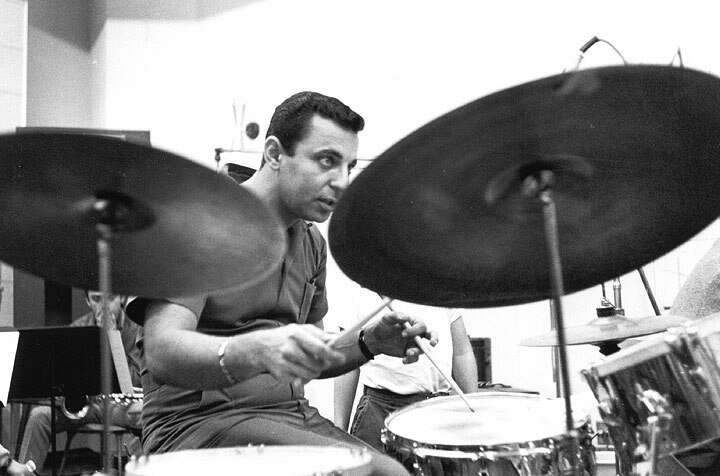 Hal Blaine alone estimates he’s played on 35,000 sessions. Thirty five! Thousand! Playing 3 sessions a day for 7 days a week, that’d take him about 30 years going by my calculations. At the height of their activity, I reckon The Wrecking Crew must’ve been doing 50 sessions a week, easy. One day alone might produce The More I See You for Chris Montez and Coconut Grove for The Lovin’ Spoonful before lunch, Dizzy with Tommy Roe and It Never Rains In Southern California with Albert Hammond in the afternoon and a longer session with Simon & Garfunkel in the evening – Homeward Bound and off to tuck the kids into bed. (In the chronology of it all, doing these 5 particular records might’ve been impossible, but you know what I mean). Not a bad day’s work, and, it seemed, every day in The Wrecking Crew calender was like that. 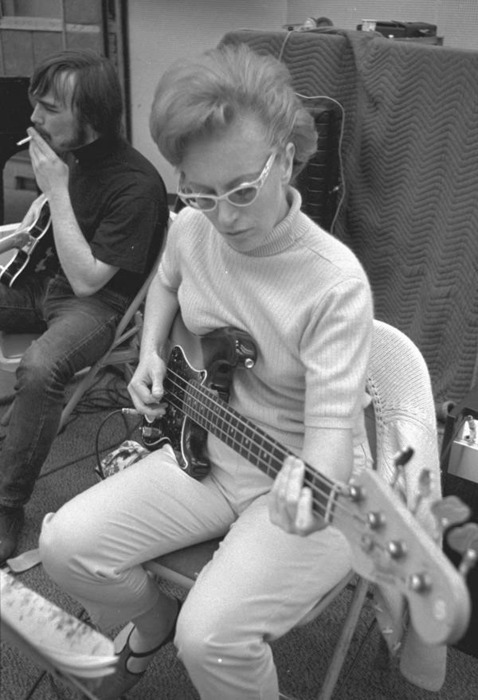 Carol Kaye – Bass Catch. Ridiculously funky, even for a white man from the West Coast of Scotland. That’s Carol in the picture above. The hippy dream set to the most fruggable bassline since the word ‘frug’ was invented. The Mamas and The Papas – Somebody Groovy. The hippy dream sang beautifully. Michelle Philips. Aaaaaaah. Sonny & Cher – The Beat Goes On. Written by Sonny Bono, the title is inscribed on his gravestone. Later covered in a big band jazz stylee by Buddy Rich, with his 10 year old daughter doing the Cher parts. Lee Hazlewood – These Boots Are Made For Walkin’. Kind of a post-demo, if there is such a thing, Lee’s version takes the same backing track from Nancy Sinatra’s hit single, but he tells the story of how they recorded it. Essential listening! Brian Wilson haranguing Hal Blaine and co. during the recording of Wouldn’t It Be Nice. Quiet please, genius at work. 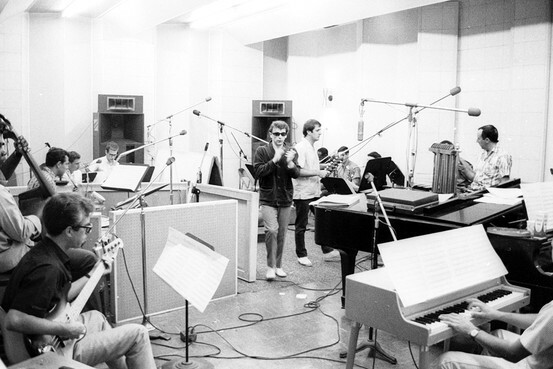 Phil Spector haranguing Hal Blaine and co. during the recording of Be My Baby. Wonderful! Brilliant post, this is the sort of thing that shows that people like me are just playing at this music blogging stuff. Och, too kind Drew. Had extra time on my hands yesterday so went for one of my in-depth, lets pretend you write for Mojo type articles. If only. Ha. I’ll be back to the usual ham-fisted meanderings before you know it. You should go and see the film if you get the chance. It deserves a proper audience and release. Saw it in Stereo with a QA session followed by DJ set from Gerry Love. Great wee night out. Great post. What an intriguing back story to the music we all cherish. And how great is it to know the backstory of the people behind the music! Thanks for the comments – it is a truly great story, isn’t it?